What Can SEO Do for My Business and Why is SEO Important. This, one of the top SEO-related searches on Google, reveals the unfair characterisation of SEO in digital marketing. To be honest, SEO is the soul of digital marketing. Had search engine optimisation been dead, digital marketing would have been dead already. In fact, SEO has become an inevitable part of branding strategies of businesses, especially those that seek regional and local search engine rankings. If you’re wondering about what can SEO do for my business? Here it is! No matter if you run a retail, small business or services business in the UK, you need UK SEO to reach out to your audiences, boost sales, establish loyal customer bases, and ensure that your sales copies are not overlooked. SEO becomes your regional/local advisor to gather data, create content, and disseminate information based on customer preferences. SEO serves regional and local marketing purposes for all – from small-sized brick and mortar establishments to large businesses. Collective data from various studies reveals that at least 50% of search engine users look for local businesses. To find a SEO company in UK, you need to know about how SEO serves more than just digital marketing. Have a look and see what is SEO in the business! In a general perspective, search engine optimisation refers to boosting your website’s ranking for certain keywords. In broader and marketing-based spectrum, SEO brings certain value for your specific business goals. For instance, if you want to create brand awareness and generate more leads, you can choose regional or local SEO tactics, or choose content-specific SEO for establishing a brand-loyal customer base. Successful marketers rely on generic marketing for increasing the number of visitors, and mindsharing and word-of-mouth marketing for establishing loyal customer bases. Bounce rate is the rate of visitors closing the tab or switching to another website without navigating through your website. When your website is optimised on the search engine, the chances of more visitors arriving on your website are higher. With SEO, the (un-bounced) visitors land on your webpages, they navigate through the website, check its content, search keywords, view products, and perform a few other activities before closing the tab or moving to another website. With each such visitor, you gain more mindshared ratio and increased chances of word-of-mouth marketing. Even if the leads do not complete a purchase process, the information on your website is processed in their minds. This way, SEO converts the leads into potential customers. Among all traditional offline marketing and advertising techniques, SEO is privileged in a way that it helps earn higher and more consistent ROI. As a direct marketing technique, it does not interrupt the viewers while watching their favourite show. Instead, it appears on the screen only when people search its relevant content. This B2C relevancy neither bothers the customers, nor needs it to convince them. You can initiate a purchase process as soon as you want in your sales funnel without requiring to create a separate sales strategy. With low investments and high returns, SEO is every marketer’s favourite strategy even after more than a decade of its crowning. As you do not have to convince the visitors or attract them to your products, you can create product or service specific content to create awareness or stimulate a purchase process by providing information of your business. You can use online tools, such as Google Analytics to get insights about your leads, potential buyers, and customers. You can use the information to create customer-specific content, such as promotional emails and giveaways to boost sales. This information can be used to improve the user experience, your website’s content, functionality, and other website features to improve the experience of your prospects and customers and build a loyal customer base. Insightful marketing is the essence of making calculated decisions. As digital markets have become densely populated and concentrated, search optimisation in the UK has proven to be the strongest technique to mitigate risk and maximise profits. 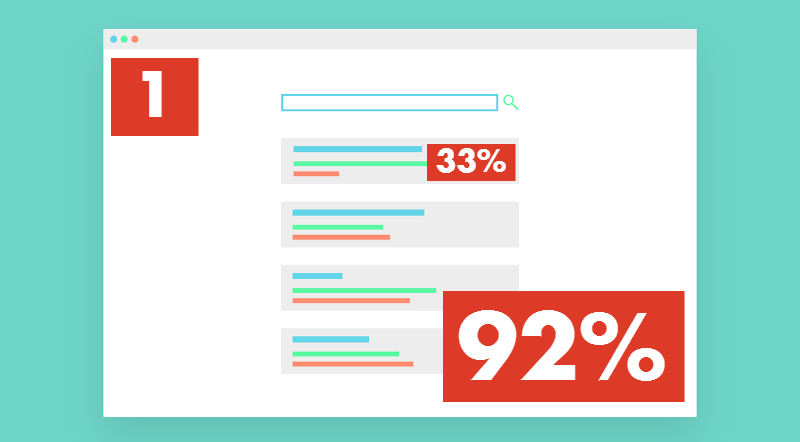 Around 92% of the online users do not search content beyond the first page of Google. Among them, at least 33% of the users visit the first website on the first search webpage. SEO can help boost your business in the frontline industry by at least 1.8X. Search engine optimisation helps you become one of the frontline industry players. Along with that, you can build contacts within the online network of the industry with off-page SEO techniques, such as link building, PR and social media. Pay-per-click marketing is not a term unknown to any of us. It apparently serves all the marketing purposes: visibility, customer reach, branding, and awareness. Considering this scenario, it is justified for businesses to ask as to why they should not focus on PPC, and prioritise SEO over it. Here, we explain. Organic SEO is apparently slower, but has longer life. PPC, in contrast, is faster but short-termed. PPC could kick-start your business for short-term goals; however, traffic stops pouring in as soon as you stop paying for the online ads. SEO, in contrast, does not abandon your business and keeps driving traffic even when you reduce the amount of money or effort you put into it. Simply put, PPC requires a considerable chunk of your monthly marketing budget to keep driving the traffic in. Organic SEO builds and grows with time, but once it is established, it helps you achieve your marketing and branding purposes without requiring a lot of money or effort. Digital marketers recommend organic SEO over PPC, because it is more reliable, goal-oriented, and consistent. Today, SEO is not the process of optimising your website on search engines. It has become an art of extracting the values associated with SEO, which include customer loyalty, brand and product awareness, increased leads, boosted ROI, and many other values, which you might not want to miss. Wondering how to find a SEO company in the UK? Get in touch with us now!